Bar Mitzvah Framed Art Print by Mickie Caspi. 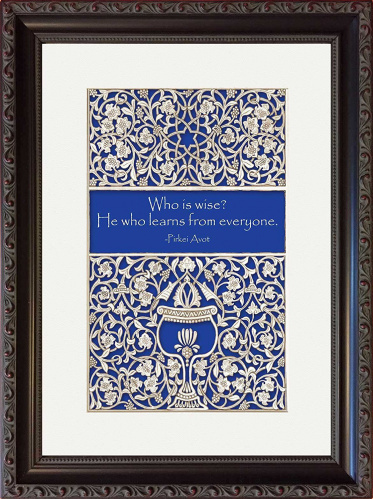 The quote from Pirkei Avot “Who is Wise? He who learns from everyone” is beautifully situated in the center of an image featuring the Star of David on top and a Kiddush Cup on the bottom. This Bar Mitzvah print uses blues, whites and grays and is a perfect gift – already matted and framed and ready to hang. Measures 11" × 15". Ready to hang, matted and framed. Personalized black/gold plaque is an option. $25. Please select above and write in name and date & personal message.